DAVID FABER: Alright. It is the biggest bank merger we’ve seen in a decade. 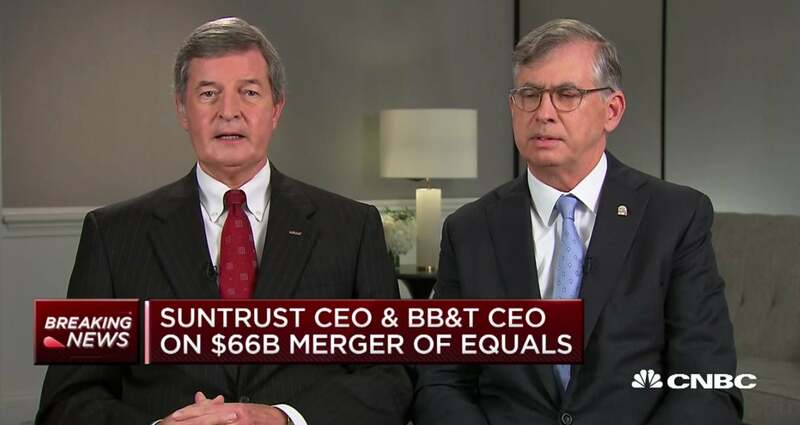 BB&T and SunTrust announcing a $66 billion merger of equals this morning. The new company will become the sixth largest bank in the U.S. BB&T CEO Kelly King and SunTrust’s CEO Bill Rogers join us in an exclusive interview from Charlotte, North Carolina. Gentlemen, thanks to you both for being with us this morning. Mr. King, let me begin with you. Both you and Mr. Rogers have certainly fairly recently outlined your views of going it alone, of the strength of both your franchises, so why is now the right time, and how did this actually come to fruition given, of course, that both of you certainly have seen a very strong path ahead for both of your companies as independent? KELLY KING: Well, we’ve both been very laser focused on organic growth because frankly that is the best way for any company to growth itself from a quality and a profitability perspective. And to be honest, it’s the only thing you can really control. But at the same time Bill and I have talked for a long time from an industry perspective about the changes in our industry, and the tremendous increase in the need for technological investment to be able to provide the level of digital capabilities that our clients now demand. And our clients now demand what I call real-time satisfaction. They want what they want, when they want it, right here right now. And so we are all facing an increasing set of complex economic realities where we have to invest more and more in technology. So while each one of us are doing fine today, we both recognize that to go forward, move forward with the best premiere financial institution, we needed additional scale so that we can make the technological investments necessary to provide the digital platform and other technological support features. And so as we talked over the last few weeks, we recognize that we had two great companies that were doing fine but working together we could do even better. BILL ROGERS: Yeah, I think the key of the "E" is that it it’s “E.” And we two really strong institutions coming together. But Kelly and I also talked about, it has to be for something, you know, so this is for the future and building for the future. And Ii look at it as we’re doubling down on organic. I mean, we’re now creating the sixth largest bank in the country who is going to have significant organic growth opportunities. DAVID FABER: Mr. King, I’ve followed mergers and acquisitions for a very long time. I think it’s fair to stay that merger of equals have a somewhat checkered history. Some work, some don’t. You said on the call you’re going to make this the best merger of equals that has ever been done. How are you going to do that? KELLY KING: Well, fortunately I’ve had some experience. As you may know we did a very successful merger of equals in 1995, and I recognize that that was a number of years ago, but it is a very important level of experience that we have had. And so, number one, we know what we’re getting into. But the most important thing is that we have two companies here that are very culturally aligned. We have the same kind of mission, same kind of purpose. We’re focusing on helping our communities. We’re focused on our clients. We’re focused on our associates. And Bill and I are experienced In terms of doing mergers, we’ve both done a lot of mergers, and so we are already way ahead of the game in terms of thinking conceptually about how these companies will come together. And importantly, we’ve learned that you start immediately. We have already built our executive team, for example. We know already, we announced in our deck this morning who they are, what their functions are. We are now building the second level of senior leadership under them. We will begin next week with the executive team leading the immigration process. We will be working together to pick the best systems, the best processes, the best people in all of the various areas. So it’s a methodical and very difficult process, but it’s conceptually fairly easy to understand what to do. The key is to do it, do it fast, do it efficiently, keep a keen eye on your clients and associates, be very sensitive to your communities, and that’s exactly what we’re going to do. DAVID FABER: Mr. Rogers, actually, let me -- can I ask you a question, sir? BILL ROGERS: Yep. Yep. Sure. DAVID FABER: It is a true merger of equals, no doubt. Although your shareholder base is only going to own 43% of the combined company versus 57% for BB&T shareholders. How did you get a M.O.E., given you were the smaller company, and are going to own – or your shareholders are going to own a smaller percentage of the overall? BILL ROGERS: You know, because, and it’s a testament to -- to our relationship, is it started as an “E” day one. It initially started and Kelly’s conversation was: Let’s have board and let’s have management equal. We didn’t really talk about the other ownership percentage was. That wasn’t the discussion. It’s what can we together, what’s a complementary business do to going forward? So I think it’s just a testament to the partnership, to the mentality that we have, and as Kelly said, I mean, we’re confident that we are going to have the best M.O.E. possible because we’re off to the best start possible. DAVID FABER: 12.5% of combined expenses for targeted in terms of cost savings, roughly 1.6 billion. Mr. Rogers, why is that the right number? BILL ROGERS: Well, we’ve – I’m sorry Kelly -- we’ll both take that. KELLY KING: Well we have talked about it together. KELLY KING: We’ve done the numbers together. Our financial people did most of the work, but we have tremendous overlap in our branches. We have about 750 branches that are within two miles of each other. And so it’s relatively easy to get the kind of consolidations that we would like to have there. As you would expect we have the very same kind of systems and same loan systems, deposit systems, et cetera, and you pick the best and you destroy the other, so we’ve done actually a lot of math around coming up with that number. To be honest, it’s a fairly conservative number. But we believe in being conservative. We’re both conservative institutions, and we would rather expect that there would probably beat those projections. BILL ROGERS: And I think, as Kelly said, and we have said throughout, it wasn’t about the cost saves, it’s about what can we invest, and creating the capacity to continue to invest in our company. And I think this level of cost saves gives us a significant running room in terms of investing for the future. DAVID FABER: Yeah. Now, you mentioned, of course, 750 branches within two miles of each other. Orlando, Atlanta. You guys are, you know, number one and four, number one and five in terms of deposits. Can we expect and should your employees be braces for layoffs as a result of potential closure of branches and the consolidation and cost savings that you’re talking about? KELLY KING: Yes, so we announced this morning in our call and in our communication directly with our associates that Bill and I are both saying to our respective associate groups that we are saying to our client facing performing associates: Don’t worry, you have a job. We’ve learned in mergers in the past that it’s very important that the people dealing that are directly with clients, that they need to know right now immediately that they have a job. And I re-emphasize for those of our associates, at SunTrust and BB&T that are all watching and listening now, if you’re a client facing associate and you do a good, good job, then your job is assured. Because here’s why that is important when the client walks in. KELLY KING: They don’t care about me and Bill. They don’t care about mergers and metrics and all that kind of thing. They walk up to the associate and they say: Are you going to be okay? And if the associate says: Yes, I have a job, I’m going to be okay, then the client says: That’s cool and they move on. So we will take care of our client facing associates, they are sure of a job. And we’ll work with everyone else, not just the client facing associates, but we’ll work very hard so that this is a good experience for everybody we’re very compassionate organizations. We want to help everyone be successful. More importantly we want them to be happy, and so we’ll be working very hard to make this a very good, pleasant, happy experience for everybody involved. BILL ROGERS: I don’t think you’re going to find any -- any banks that care more about their teammates’ associates than the two of us, and Kelly and I are committed to making this work. CARL QUINTANILLA: Hey, Bill. When viewers think about the competitive pressures you’re under, particularly in the digital space, should they think first about the money centers, or is it more about non-banks? BILL ROGERS: I think what -- Kelly and I think about the competition is everybody. And the competition is for our clients and making sure that we’re -- making sure that we’re relevant. And the good news is we come in with really good strength. I mean, we’ve got great performance on our digital platforms. We’ve been making investments to date so what we get to do is double down on that. So we view the competitive environment that anybody who is trying to acquire clients, and we want to be the most relevant, the most competitive and the most innovative against all competition. KELLY KING: And what we really, really focused on is the fact that in today’s world there really is something I call ‘key to the third power.’ It’s about touch, it’s about technology resulting in trust. KELLY KING: And so we have fantastic touch, we always have. We have really good technology. But we’re going to, as Bill said we’ll double down on technology so that integration of the touch and the technology meets the clients where they want us to meet them with the best service and quality of the delivery and that gives you the optimum client experience. SRA EISEN: Kelly, obviously the market likes the deal. Both stocks are up. They like the cost saves. But there are some questions from folks I’m talking to about what it signals about the overall environment, whether this indicates some sort of peak for retail banking, a tougher outlook ahead, the end of rising net interest margins. How do you see it? KELLY KING: I’m sorry, you were breaking up just a bit, but I think your question was how do we see retail banking going forward and the margins and pressures and all that we’re facing in terms of competition. Was that the question? SARA EISEN: Yeah, and whether this deal indicates some sort of inflection point in terms of a tougher road ahead for retail banking and net interest margins? KELLY KING: Yeah, yeah, yeah. Very insightful question. Retail banking is getting much more difficult. You know the fintechs, the additional investments that are required, the fact that consumers and retail clients of all types, including small businesses, require real-time satisfaction demand. It’s a sea change in the last three or four years. So it is much tougher to your point. That’s why we have to do what we’re doing. That’s why we have to combine the skill and the capacity, to make not just investments to follow but to lead. We have to be out in front of our clients asking them: what do you need? What do you want? And then we have to be on our toes figuring out how to deliver those solutions. We now have the capacity. We have the initiative. Bill and I are going to co-lead focusing on our new innovation and technology center which will be in our new headquarters in Charlotte because we think that that is the most important. As we lean forward, it’s not about looking backwards, it’s about looking forward. It’s about how do we create the kinds of products and services and processes that not only meet the needs of our clients but exceed the needs of our clients. BILL ROGERS: I would say the business has been change and will change. I’m not sure that there’s a particular infliction point. As Kelly said, this is just going to give us the opportunity to be the absolute most competitive bank in the country. DAVID FABER: Well, gentlemen, judging from the way you finish each other’s sentences you’re off to a good start. But you’re going to be working together for a very long time as CEO and COO. and then as Chairman and CEO. Can you assure people that you’ll get along and are prepared to have that long relationship through, you know, what will certainly be – it sounds like you’re getting married here, both good times and bad? KELLY KING: Yeah. We’re going to get along great. We’ve known each other a long time. And, you know, we’re both North Carolina boys as I like to say, even though Bill has spent most of his experience in Georgia which I have a great respect for. But we’re very much alike. We grew up alike, we have very similar backgrounds and mostly we have a really deep passion for our people, for our associates, for our clients, for our communities. You know, Bill nor I are the kind of folks who get up in the morning trying to make a lot of money. We don’t worry about the stock price. We get up in the morning trying to make the day a little better. We try to improve the financial well-being for our clients. We try to make the world a better place to live. We will get along perfectly. The challenges that we have will not be us working together. BILL ROGERS: I think egos checked at the door, you can see that. DAVID FABER: Yeah, Look, a couple of -- let me just end here with a quick follow-up. You seem to indicate that you’re not going to lay anybody off. Is that correct, Mr. Rogers? BILL ROGERS: No. I think what Kelly said is what we’re going do is we’re going to be compassionate. We’re going to plan long-term. If you think about the branch consolidation as an example, it really doesn’t start until 2020. We have natural attrition in our business so it’s not about -- it’s about the fact that I think over time we’ll be able to consolidate and do this in a way that has the least amount of impact for teammates and associates as much as possible. DAVID FABER: Alright. Finally, any ideas on a name, Mr. King? You guys getting close? KELLY KING: We haven’t figured out the name yet. You know what we’re going to actually do. We’ll use some out research schedules and we’ve got a lot of our associates to help us figure this out. Bill and I know one thing, we will not know the right name. KELLY KING: We need a name that our young associates, our millennial associates, you know, our clients, pick. It’s not about what name we like. It’s a name that resonates with our clients. Conceptually, it is a name that’s a forward pointing, exciting name that says: this is a company that is moving forward. Yes, this is a company that has a really good legacy. This is a company that is on the move. They are on their toes. They are moving forward and that’s exciting to me. When we find that name, we will know it. DAVID FABER: Alright. Well gentlemen, we’ll stand by. We appreciate you joining us this morning. Kelly King and Bill Rogers. Thanks to you both.